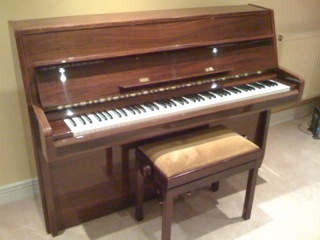 One of my students is selling this lovely Reid-Sohn upright piano as they are trading up to a grand piano. This piano is in great condition having been well maintained and regularly tuned since it’s purchase 12 years ago. The asking price is £900. The piano would be suitable up to Grade 8 and beyond. It has 3 pedals and is a mahogany finish. The model number is RS042 which retails new at £2,350 without a stool. The stool is included in the sale. For more information and to arrange a try-out of the piano, send me an email. This entry was posted in Piano for Sale and tagged Piano for sale London, Reid Sohn piano for sale, Secondhand piano for sale. Bookmark the permalink.